Millennials, in general, are those citizens born after 1980 and before 2000. They are by definition between the ages of 38 and 18, well removed from the Baby Boomers who may be their parents or grandparents, and coming into their own behind Generation X, which is now looking ahead to the day when they can consider retirement. Generational issues appear among financial advisors whenever a new crop of investors turn up. After decades of serving the affluent Baby Boomer generation and the Gen X investors, advisors are not cranking up their efforts to get to know the Millennials, the oldest of which are reaching the prime period for income growth from their employment. The problem that exists for financial advisors trying to woo Millennials is that these young investors are not yet old enough to understand the need to hire an advisor for investment purposes. According to Spectrem’s latest study of the relationship between advisors and investors, only 70 percent of Millennials use an advisor to any extent, and of those, only 19 percent have any level of dependence upon their advisor. Rather, according to Millennials and Generation X Investors: Attracting the Next Generations of Wealth, 54 percent consider themselves to be Self-Directed investors with virtually no correspondence with an advisor, and 28 percent consider themselves to be Event-Driven investors who only communicate with an advisor for specialized life events like retirement planning. That’s 82 percent of Millennials with limited use of financial advisors. For comparison, 38 percent of Baby Boomers consider themselves to be Advisor-Dependent or Advisor-Assisted, with extensive use of an advisor, who either helps an investor with most investment decisions or makes the decisions for the investor at all times. The Millennials who decided to hire a financial advisor most often did so when they believed their asset level reached a point where having an advisor seemed a legitimate need. Sixty-three percent of Millennials who have a financial advisor made the decision based on their own asset level. However, advisors should note that 35 percent of Millennials hired an advisor simply because they did not have time in their busy, multi-faced lives to handle their investments on their own. This is a huge selling point for advisors: taking some of those investment decisions off of their hands can free them to consider other life decisions and can also eliminate concern Millennials might have that they are not doing all they can with their investable assets. Among the 30 percent of Millennials who do not have an advisor, almost half say they do not believe an advisor would have their best interests in mind, which is an alarming percentage of doubters. Only 22 percent say they can’t afford an advisor and 17 percent say they don’t have the asset level that requires the attention of an advisor. Among Millennials who use an advisor, 39 percent use either a banker or an accountant as their primary advisor, which is an indication many Millennials have not moved past the first stage of investing and financial decision-making. For almost all Americans, the first financial expert they deal with is either their banker or their accountant, and these Millennials have not moved on beyond that relationship. Advisors would do well to present to Millennials the ways they can benefit a portfolio beyond the abilities of bankers or accountants, who are more likely to serve as financial handlers rather than as investment advisors. There is a generational difference in advisor satisfaction, and Gen Xers are the least satisfied among four generations of investors, with only 71 percent reporting overall satisfaction with their advisor. By comparison, 75 percent of Millennials with an advisor are satisfied. The key to working with Millennials is getting in. Many Millennials avoid using an advisor, while others who use an advisor employ their services sporadically. 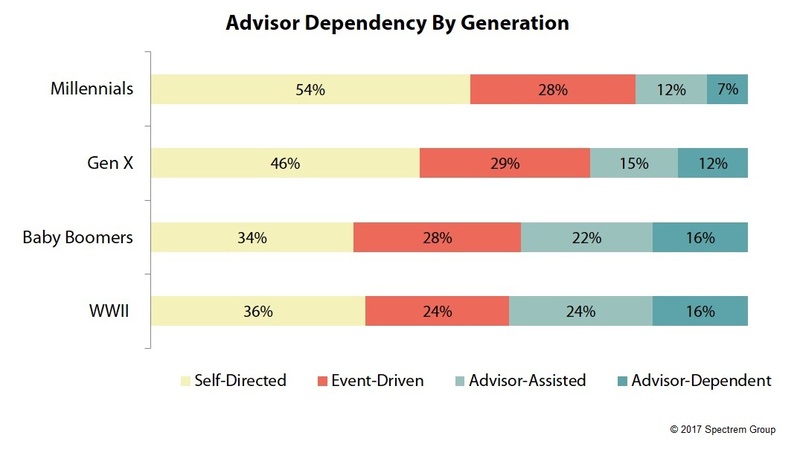 But Millennials will someday be older, and will likely use their advisor more significantly. The key to the relationship is getting it started. Advisors need to put an eye toward those Millennials who are using a banker or an accountant as their primary advisor. Eventually, Millennials will want more services than their initial advisor can offer. Over time, investments become more sophisticated and complicated and that is where an advisor with greater service options can be useful and appreciated.